IRVINE, CA and WASHINGTON, DC--(Marketwired - Dec 6, 2013) - Masimo (NASDAQ: MASI) today announced the launch of iSpO2™ Rx Pulse Oximeter with M-LNCS™ connector, enabling adhesive sensor use on newborns for accurate and cost-effective screening with mobile devices in low-resource settings. iSpO2 Rx features Masimo SET® technology -- shown through studies to be the most accurate pulse oximetry during challenging conditions and proven to help clinicians identify life-threatening conditions in newborns. iSpO2 Rx, available outside the U.S., provides accurate oxygen saturation (SpO2), pulse rate (PR), and perfusion index (PI) results from an iPhone, iPad, and iPod touch, and soon on select mobile devices for Android™. iSpO2 Rx, announced ahead of the mHealth Summit in Washington, D.C., Dec. 8-11, is the lynchpin of an ongoing collaboration with the Newborn Foundation, and marks the debut of the BORN Project -- Birth Oximetry Routine for Newborns -- the first global health initiative to reduce infant mortality through earlier detection of illness, disease and congenital birth defects through access to mobile-enabled technology that measures blood-oxygen levels in newborns. Until now, available pulse oximeters in low-resource settings have been inaccurate, lacked the ability to use adhesive sensors required for screening newborns, and were unable to simply and wirelessly transfer test results. Globally, about 3.3 million newborns die within the first month of life, with neonatal infection, sepsis, pneumonia and birth defects among the major killers, according to the World Health Organization. The BORN Project was developed to help reduce neonatal mortality, a critical Millennium Development Goal, by deploying accessible and effective mobile technology targeting early detection of several of the major causes of newborn death. Clinical studies have shown that pulse oximetry screening can help detect conditions such as pneumonia, early-onset sepsis, neonatal infection and pulmonary hypertension,1 in addition to congenital heart defects. "This simple, noninvasive check of oxygen levels in newborns is among the most effective health measures that can be deployed to reduce newborn mortality," said Annamarie Saarinen, co-founder and chairman of the Newborn Foundation. "We just saw how valuable this is, firsthand, while in the Philippines during Typhoon Haiyan. The mHealth Summit marks a historic opportunity to share this initiative and new technology that is finally available to babies in low-resource healthcare environments through mHealth innovation. We're very excited to be partnering with Masimo and public health to deploy this technology and advance its use as part of routine newborn care." "From a public health perspective, neonatal infection, sepsis and pneumonia can all be treated more effectively if the conditions are detected early," said Darshak Sanghavi, MD, fellow and managing director, Engelberg Center for Health Care Reform at the Brookings Institution and associate professor of pediatrics at the University of Massachusetts Medical School. "Incorporating routine pulse oximetry as a universal 'vital sign' in newborns could be an important global life-saving tool." "Through the BORN Project, Masimo is eager to help clinicians -- especially those working in low-resource areas of the world -- gain access to Masimo SET iSpO2 Rx as the most effective, affordable pulse oximeter that is accurate in challenging conditions of patient movement and low perfusion to help save the lives of newborns," said Masimo founder and CEO Joe Kiani. iSpO2 Rx also features a downloadable and upgradeable iSpO2 Rx App, ensuring clinicians have the latest telemedicine technologies at their fingertips at all times. iSpO2 Rx can store and email up to 12 hours of measurement history in a global standard .CSV file format. iSpO2 Rx with the M-LNCS connector are compatible with Masimo adhesive and reusable sensors, and are uniquely designed to offer the best pulse oximetry performance for use in neonatal, infant, pediatric, and adult patients. 1 Ewer A. Review of pulse oximetry screening for critical congenital heart defects in newborn infants. Curr Opin Cardiol 2013;28:92-6. 2 Castillo A, et al. Acta Paediatr. 2011 Feb.;100(2):188-92. 3 de-Wahl Granelli A., et al. BMJ. 2009 Jan 8;338. 4 Ewer A, et al. Health Technol Assess. 2012;16(2):1-184. The Newborn Foundation is an international non-profit working specifically to leverage health IT and medical technologies to improve access and outcomes while reducing disparities for newborns. The organization has been integral in the policy development, adoption and implementation of technologies for early detection, intervention and care of the youngest patients, including universal newborn heart screening as a public health initiative. Masimo (NASDAQ: MASI) is the global leader in innovative noninvasive monitoring technologies that significantly improve patient care -- helping solve "unsolvable" problems. In 1995, the company debuted Measure-Through Motion and Low Perfusion pulse oximetry, known as Masimo SET®, which virtually eliminated false alarms and increased pulse oximetry's ability to help clinicians detect life-threatening events. In 2005, Masimo introduced rainbow ® Pulse CO-Oximetry™ technology, allowing noninvasive and continuous monitoring of blood constituents that previously required invasive procedures; total hemoglobin (SpHb®), oxygen content (SpOC™), carboxyhemoglobin (SpCO®), methemoglobin (SpMet®), PVI®, and perfusion index (PI), in addition to measure-through motion SpO2, and pulse rate. In 2008, Masimo introduced Patient SafetyNet™, a remote monitoring and wireless clinician notification system designed to help hospitals avoid preventable deaths and injuries associated with failure to rescue events. In 2009, Masimo introduced rainbow® Acoustic Monitoring™, the first-ever commercially available noninvasive and continuous monitoring of acoustic respiration rate (RRa™). Founded in 1989, Masimo has the mission of "Improving Patient Outcome and Reducing Cost of Care … by Taking Noninvasive Monitoring to New Sites and Applications®." 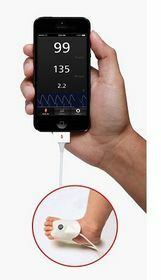 Additional information about Masimo and its products may be found at www.masimo.com. This press release includes forward-looking statements as defined in Section 27A of the Securities Act of 1933 and Section 21E of the Securities Exchange Act of 1934, in connection with the Private Securities Litigation Reform Act of 1995. These forward-looking statements are based on current expectations about future events affecting us and are subject to risks and uncertainties, all of which are difficult to predict and many of which are beyond our control and could cause our actual results to differ materially and adversely from those expressed in our forward-looking statements as a result of various risk factors related to the new iSpO2 Rx, including our belief in the breakthrough ability of Masimo SET® pulse oximetry to measure-through motion and low perfusion; as well as other factors discussed in the "Risk Factors" section of our most recent reports filed with the Securities and Exchange Commission ("SEC"), which may be obtained for free at the SEC's website at www.sec.gov. Although we believe that the expectations reflected in our forward-looking statements are reasonable, we do not know whether our expectations will prove correct. All forward-looking statements included in this press release are expressly qualified in their entirety by the foregoing cautionary statements. You are cautioned not to place undue reliance on these forward-looking statements, which speak only as of today's date. We do not undertake any obligation to update, amend or clarify these statements or the "Risk Factors" contained in our most recent reports filed with the SEC, whether as a result of new information, future events or otherwise, except as may be required under the applicable securities laws. Masimo, SET, Signal Extraction Technology, Improving Patient Outcome and Reducing Cost of Care… by Taking Noninvasive Monitoring to New Sites and Applications, rainbow, SpHb, SpOC, SpCO, SpMet, PVI, rainbow Acoustic Monitoring, RRa, Radical-7, Rad-87, Rad-57,Rad-8, Rad-5,Pulse CO-Oximetry, Pulse CO-Oximeter, Adaptive Threshold Alarm, and SedLine are trademarks or registered trademarks of Masimo Corporation. The use of the trademarks Patient SafetyNet and PSN are under license from University HealthSystem Consortium. All other trademarks, service marks, trade names, logos and icons, registered or not, are the property of third parties as named/indicated. iSpO2 Rx Pulse Oximeter with M-LNCS connector.